Introducing the most MotoGP-Inspriced motorcycle ever. Your wish for a production MotoGP bike pretty much just came true. From the advanced MotoGP inspired electronics package and crossplane crankshaft engine layout as the factor M1, to its carbon fiber components and Ohlins electronic syspesion, the line between Supersport bike and factory MotoGP M1 have never been more blurred. 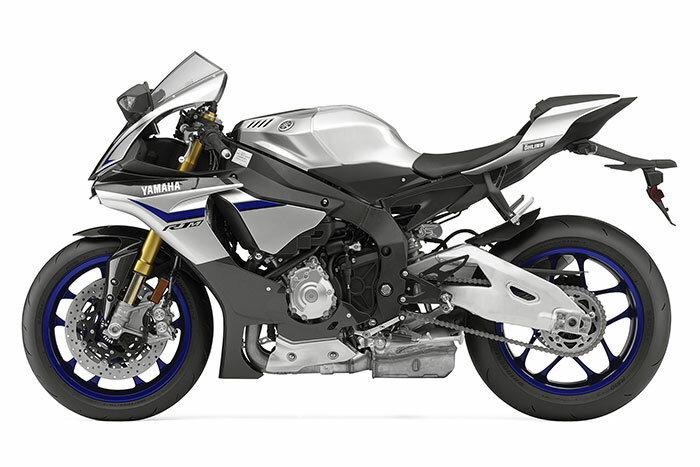 Based on the all new R1 the incredible R1M is the pinnacle of Yamaha’s pure racing technology. It provides a riding experience like nothing before it. Power delivery is very linear and controllable with our comprehensive YRC electronic controls. Add in premium features including an Ohlins Electronic Racing Suspension, lightweight carbon fiber bodywork and our new Communication Control Unit that is both a data logger and data setting tool, you have a machine that is destined to improve racing skills and results. YZF-R1M race motorcycle is a special version of the all new R1, and comes with even higher factory specification – enabling every racer and track rider to discover their true potential. 6-axis Inertial Measurement Unit (IMU) offers controlability over traction, slides, front wheel lift, braking and launches. Its Communication Control Unit with GPS allows to look at lap times and other running data on an Android-based tablet – and R1M’s Electronic Racing Suspension (ERS) delivers ultimate handling. • All new, ultra-lightweight, compact, 998cc, DOHC, 16-valve (4-valves / cyl. ), liquid-cooled, in-line four-cylinder engine with “cross plane” style crankshaft. • The key components of this cutting edge engine design are the “cross plane” crankshaft and an uneven firing order. Both of these features are used on Yamaha’s race winning M1 MotoGP racer. The R1 cross plane crankshaft locates the center two rods at a 90 degree plane from the outer cylinders. This means instead of the crank pins aligned on the same plane (a straight line drawn through the center of the crankshaft), they align on 2 planes in the form of a cross… or “cross plane”. Working in conjunction with the cross plane crank is an uneven firing order. This R1 engine fires 1,3,2,4 cylinders and the firing intervals are uneven at 270 / 180/ 90 /180 degrees. What all this means to the rider is the most linear torque possible and amazing throttle control. This engine design allows a whole new level of rider – machine communication. One of the most important benefits is the outstanding cornering performance that increased engine control allows. 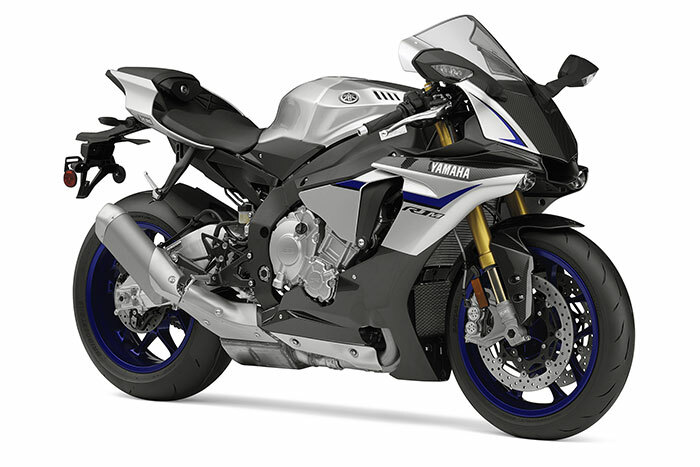 • The key engineering goal for the new R1 is increased power with excellent controllability. Horsepower increases have gained through increased intake air volume, reduced internal friction and weight reductions. The new R1 is a “rider’s machine”. • New, 4-valve cylinder head design features new compact pent roof combustion chambers that utilize lightweight titanium valves on the intake side. The 4-valve design optimizes breathing efficiency and overall engine performance. Combustion chamber volume is carefully monitored to ensure exact volume for maximum power. • New, larger valves for 2015. Titanium intake valves are 33mm in diameter (’14 = 31mm) while the steel exhaust valves are 26.5 mm in diameter (’14 = 25mm). The lightweight titanium intake valves reduce the reciprocating weight of the intake valves allowing for higher rpms without the concern of valve float. • New intake port shape provides maximum filling efficiency. The port shape, valve placement and combustion chamber shape induce a tumbling effect of the inbound fuel – air charge that increases combustion speed, power and torque. • Newly designed high performance intake & exhaust cams work in conjunction with the new finger follower rocker arm system. • New design, lightweight, closed deck aluminum cylinder features a ceramic coating applied directly to the liner-less aluminum block to ensure uniform heat dissipation reduced friction and reduced weight. Closed deck design allows the cylinders to be spaced more closely together, providing a narrower engine. Cylinder is a stand-alone design (not integrated into the upper crank case). • Offset cylinder / crank design offsets the cylinder block relative to the crankshaft (to the exhaust side) to reduce frictional losses between the pistons and the cylinder wall during the power stroke for improved power output. • All new, short skirt, forged aluminum pistons offer lightweight, fast throttle response and great reliability. The piston features a box shaped “bridge box ” on the underside for increased rigidity and a special Deflic coating to further reduce frictional losses. Ring expansion tension is optimized to reduce friction. • New piston oil coolers spray oil at the underside of the piston to reduce piston temperatures. • New, narrower Cross plane crankshaft design. Crankshaft is over 25 mm (1″) narrower than the ’14 version. Crank inertial moment has been engineered to achieve linear throttle response, strong acceleration and excellent cornering exit control. 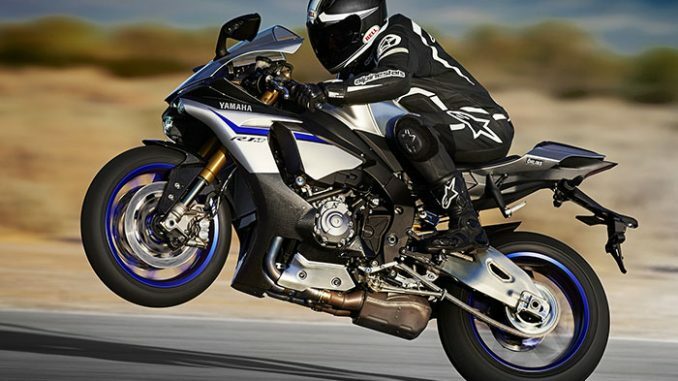 To achieve excellence response when accelerating, the inertial moment of the crankshaft has been set at a level approximately 20% less than the ’14 YZF-R1. • All new, super light, fracture split titanium connecting rods feature a nutless design. The lower end “cap” of the rod is made from the same piece of material as the upper portion and is cracked away in a process known as “fracture splitting”. This process ensures true big end roundness and greater precision in con rod dimensions. Lightweight design (60% lighter than a conventional steel con rod) reduces horsepower losses and provides faster throttle response. These fracture split “Ti” rods are a world’s first to be used on a production motorcycle. • New single axis balancer shaft is used to reduce engine vibration. • Compact ACM (alternator) is mounted directly to the crankshaft. The compact ACM uses rare earth magnets which produce more power for a given size than conventional magnets, therefore reducing size and weight. • Newly designed, Mikuni fuel injection system features twin injectors (one set of primary & one set of secondary injectors). This twin injector system is also used on our M1 MotoGP race bike and the R6. One set of injectors (primary) are located in the 45mm throttle bodies while the secondary injectors are located in the air box very near the computer controlled intake funnels. The primary injectors utilize 12-holes to maximize the fuel atomization process. The secondary injectors, located inside the air box, begin to function at mid rpms onwards to supply more fuel as required and also use 12-hole injectors. • Dual oxygen sensors (located just before the muffler box) make this a “closed loop” type FI system, which feeds back info to the ECU so adjustments can be constantly made to the fuel-air mixture for improved performance and reduced emissions. • The benefits of fuel injection include excellent throttle response, good fuel economy, reduced emissions, stable idling and no choke start up. • YCC-T: Yamaha Chip Control Throttle electronically controls the throttle valves for outstanding response and improved throttle control at all rpms. The YCC-T is used to provide super precise control of the intake air volume for smoother torque character. • YCC-I: Yamaha’s Chip Controlled Intake means the intake funnels / stacks vary in length (2 positions) depending on engine rpm. An electronic servo motor varies the funnel length from the tall position at low to mid rpms to the shorter setting for improved high rpm power. The revolutionary YCC-I provides the best of both worlds … solid low rpm torque and power combined with an amazing high rpm rush. It takes only 0.3 of a second for the funnels to move from the tall to the short position. • Maintenance-free transistor controlled ignition (TCI) provides a hot spark for sure starts and strong engine performance. • New design, compact 6-speed transmission features optimized gear ratios for maximum performance. The “stacked” 3-axis gearbox / clutch design centralizes mass and keeps overall engine size shorter front to back. The stacked design gives the engineers the freedom to place the engine in the “sweet spot” of the frame for optimum weight balance for awesome handling. • New, more compact multi-plate and assist clutch assembly (back limiter clutch) reduces rear wheel hop when making down shifts under hard braking. Key benefit is reduced lap times and smoother control. New clutch design is 19% lighter and 7% smaller in diameter than the ’14 model. • “Ram Air” system force feeds outside air via a duct located between the new LED headlights into the intake system, pressurizing the air box and improving intake efficiency at higher speeds. As speed increases, the air velocity in the system increases and pressurizes the air box, helping the engine develop maximum power. • New, larger computer optimized large capacity 10.5 litre air box maximizes performance. New M1 inspired intake duct with solenoid valve reduces intake noise and improves high rpm power. A viscous type, high flow air filter is utilized. • All new, mid ship design 4 into 2 into 1 exhaust system features lightweight titanium header pipes and muffler. This new design maximizes power, reduces weight, centralizes mass and lowers the centre of gravity for fast, light, agile handling. This system also contains dual 3-way honeycomb catalyzers which reduce harmful CO and HC exhaust emissions. • New exhaust valve device is located in the under engine chamber and it features two separate exhaust flow routes depending on rpm. By controlling the exhaust routing in selected rpm ranges, it has been possible to build a compact muffler that achieves both outstanding power output and torque characteristics while still providing sufficient silencing performance. • Yamaha’s EXUP System (Yamaha’s Exhaust Ultimate Power Valve) controls the exhaust pressure waves for optimum intake and exhaust efficiency. It also helps prevent the “blow back” phenomenon caused by valve overlap and helps reduces “flat spots” in the power band while reducing emissions at the same time. • New, high-efficiency curved radiator features dual ring-type fans for maximum cooling. This curved rad design provides more airflow than conventional flat rad designs. • New, air-cooled oil cooler sits below the main rad to maintain stable lubricant temperatures. • Water pump is located on the outside of the crankcase to reduce crankcase width. • Optimized wet sump lubrication system features new oil routing to the big end rod bearings. • New, lightweight, deep bottom magnesium oil pan. • New lightweight magnesium cylinder head cover and crankcase covers secured by new lightweight aluminum bolts. • High performance direct ignition coils (ignition coil is built into the spark plug cap) reduce weight while iridium spark plugs and high-output magneto deliver increased spark energy. Many of the following rider assist aids are derived from Yamaha’s MotoGP race efforts and help make the new R1 more controllable and more enjoyable to ride. We call them Yamaha Ride Control or YRC. 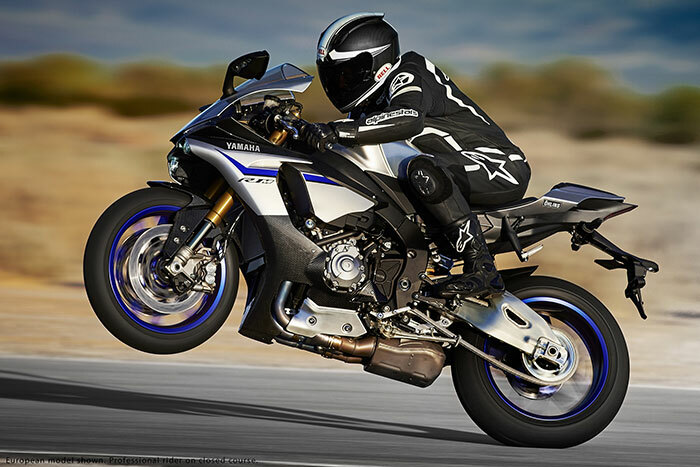 • At the heart of the Yamaha Ride Control electronic rider assist aids are the IMU or Inertial Measurement Unit and ECU or Electronic Control Unit. The IMU detects three directions of acceleration and angular velocity (total of six directions). Additionally the IMU detects primary position by the G sensor when the ignition switch is turned on. The IMU calculates each signal and finds the vehicle position and behavior (lean angle, slide speed, pitching rate, etc. ), and then in conjunction with the ECU it uses this information to control each system. • PWR: Power Delivery Mode is Yamaha’s variable throttle control that enables the rider to adjust the performance characteristics of the engine. There are 4-power settings available from an enhanced race setting to a slippery condition setting with softer power characteristics. • TCS: Traction control system with lean angle sensor features 9 adjustment settings plus an off setting for a total of 10 settings. The system uses front and rear wheel sensors to detect slip and then adjusts / regulates power via the ECU / IMU to control rear wheel traction. In addition to detecting difference in speed between the front and rear wheels, this new system uses input on the degree of bank / lean angle to adjust the degree of TCS intervention to an optimum level in relation to the riding conditions in real-time. As the banking angle increases, the amount of TCS intervention also increases. When the TCS is off, SCS, LIF and LCS systems will automatically shut off as well. • SCS: Slide Control System controls engine power when side slip is detected. It adjusts power output to an optimum level to control side slide or slip. There are 3 settings plus off. • LIF: Lift Control System (a.k.a. anti-wheelie control) reduces time loss due to wheelies during closed course competition. This system reduces front end lift during starts and acceleration. When the IMU and other sensors detect lift, engine output is adjusted to the optimum level to maintain string acceleration without lift. There are 2 settings plus off. • LCS: Launch Control System is adopted to help ensure fast, strong, controllable starts in closed course competition situations. When the LCS is activated, it keeps engine rpm limited to approx. 10,000 rpm and maintains an optimum level of engine power in conjunction with inputs from the TCS and LIF systems, allowing the rider to concentrate on clutch engagement and the other competitors, reducing stress associated with race starts. • QSS: Quick Shift System provides smooth, fast upshifts even at full throttle. When the switch on the shift lever rod detects motion, it adjusts engine output and momentarily cancels out the drive torque to promote faster gear shifts. There are 2 settings plus off. • CCU: Communication Control Unit is a standard feature of the R1M; it will be sold as an accessory for base model. The CCU monitors / records various forms of machine information and simplifies set-up of the instrument panel’s function as a rider-machine “interface.” Comprised of the CCU and a GPS receiver, running data can be recorded via a data logger, and with the GPS function, the system also enables automatic lap time recording on race circuits. This data can help racers / track day enthusiasts to improve their riding skills and lap times. By downloading an “app” for an Android or iOS based smartphones, it is also possible to create set-up data on your smartphone. Setting data can then be downloaded into the R1M via a Wi-Fi connection. • SCU: Suspension Control Unit controls the electronic adjustments (front & rear) to the Ohlin’s “Electronic Racing Suspension”, available only on the R1M. asymmetrical. • Detachable magnesium cast rear subframe reduces weight. The detachable design allows rear shock access and is less costly to repair if accidentally damaged. • Lightweight aluminum “upward truss-type” swingarm provides great torsional rigidity for excellent rear wheel traction and control. Swingarm length is 570mm, 15 mm shorter than the ’14 model and provides excellent control of the effects of chain tensioning during hard acceleration. The swingarm features a buffed and clear coated raw aluminum finish. • New, electronically adjustable Ohlins “Electronic Racing Suspension”. The use of “ERS” further enhances the performance potential of the R1M for circuit use. Taking data from the IMU and the various sensors, the system’s Suspension Control Unit (SCU) makes integrated adjustments of both the front and rear suspensions’ compression stroke and rebound damping based on riding conditions. The SCU calculates the ideal damping for the front and rear suspensions. This ERS has a choice of “Automatic” and “Manual” modes. Within each of these modes there is also a selection of 3 – running modes to make a total of six different settings to fit rider preferences or track conditions. Two of the running modes in the “Automatic” mode have fine adjustment functions for damping force. It is possible to adjust compression stroke and rebound stroke damping independently on both the front and rear suspensions. Front & rear wheel travel is 120mm (4.7″). • All new, radial mount, 4-piston monoblock calipers with aluminum pistons squeeze fully floating 320mm dual front rotors. The result is incredible braking performance with excellent control and lever feedback. Other features include; Nissin radial master cylinder, stainless steel brake lines and new front brake lever. • Single piston slide-type Nissin rear caliper with aluminum piston squeezes a lightweight 220mm rotor. • Both front and rear brakes are linked via Yamaha’s Unified Braking System (UBS) and feature our latest anti-lock brake (ABS) technology. • All new, lightweight, die cast magnesium 10-spoke mag wheels. These wheels save over 1 kg of weight Vs last year’s model and contribute to excellent suspension and handling performance. They feature a smooth exterior finish without centre ribs and an electrostatic paint process. Front rim size is MT3.50 x 17 while the rear is MT6.00 x17. 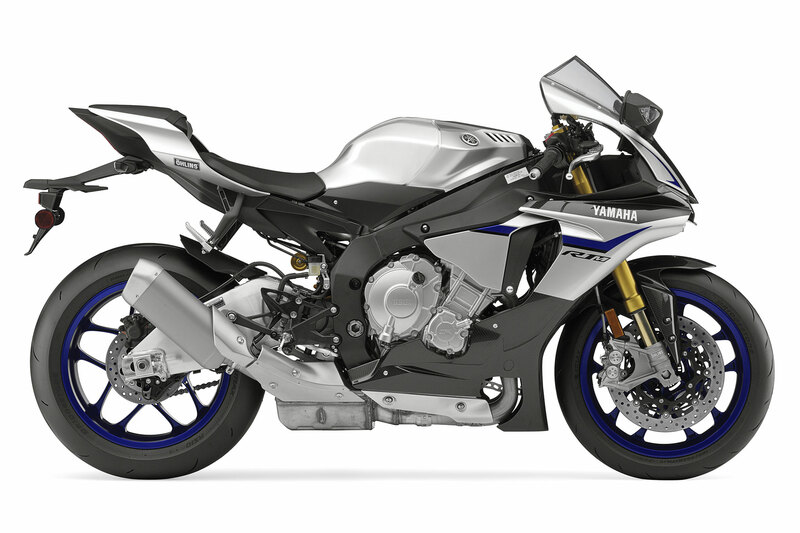 The R1M features a 200/55ZR71 rear tire. • New, lightweight 17 litre aluminum fuel tank features a buffed and clear coated raw aluminum finish. Elongated shape helps to centralize mass and reduces the variance in riding feel as the fuel load (weight) changes. This new tank is 1.6 kg (3.5 lbs.) lighter than last year’s model. • New, super light, trick carbon fiber body work including front fender and fairing. The wind tunnel designed windshield offers excellent aerodynamics and features a “screw less” design for a cleaner, more trick appearance. Air resistance has been reduced by 8% compared to the ’14 model. 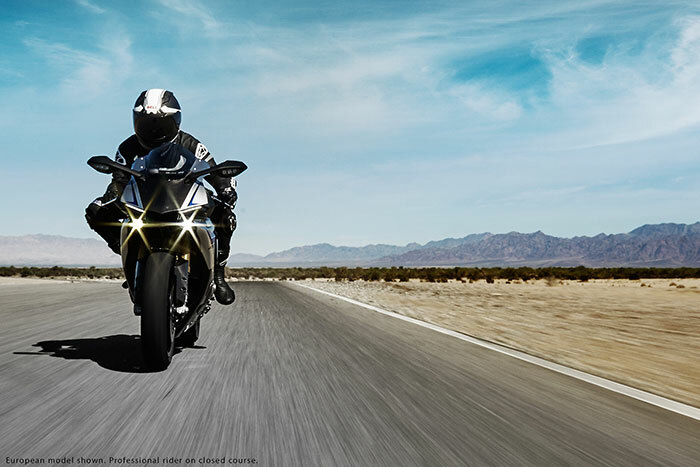 • New LED headlights and high intensity LED position lights create a “face” never seen before on a motorcycle and provide a very stylish and unique look to the new R1. • Fully digital instrument panel with TFT liquid crystal display. The instrument panel offers a striking rider-machine “interface.” Displays have been concentrated into a single 4.2-inch screen that adopts a fully transmissive Thin Film Transistor (TFT) liquid crystal display that reduces reflections and glare. White or black backgrounds can be selected and it features auto brightness adjustment based on available ambient light. Two modes are available; street and track. Street functions include; speedo, bar style tach, odometer, dual tripmeters, gear position, intake air temp, coolant temp, instant & average fuel efficiency, clock, fuel consumed, peak rpm , and YRC setting info. In the track mode functions include; bar style tach (starts at 8,000 rpm), lap number, lap timer, stop watch, gear position, speed and YRC setting info. • Immobilizer ignition system is designed to reduce the possibility of “ride away” theft. This system must recognize the “coded ignition key” in order for the unit to start. If the system does not recognize the coded chip in the ignition key, it will not allow the ignition system, fuel pump or starter motor to function. • LED front turn signals integrated into mirrors. • Extensive use of hollow bolts and lightweight fasteners help trim overall weight. • Lightweight 520 series “O” ring drive chain. • Low maintenance, lightweight, sealed battery. 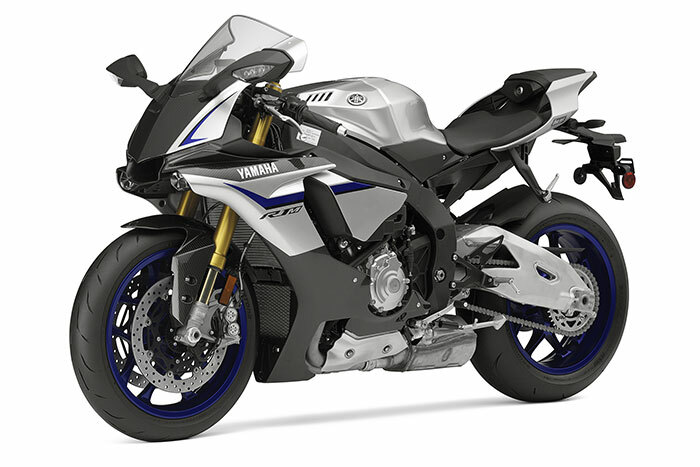 The YZF-R1M offers a significant level of power and performance. It is not intended for novice or inexperienced riders. All information is subject to change without notice.